Well, it was a grueling two days, but my MacCat Deluxe finally arrived in the mail today. 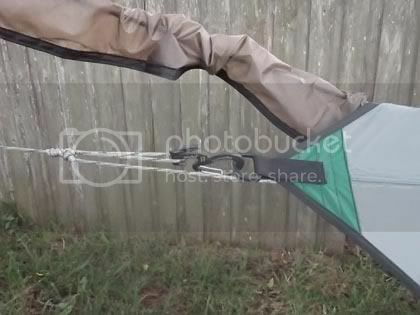 I can’t say how anxious I was to rip down the stock tarp and replace it. As soon as we’d finished dinner, the wee lad and I went out to make the swap. When I opened the package, this is what I saw. 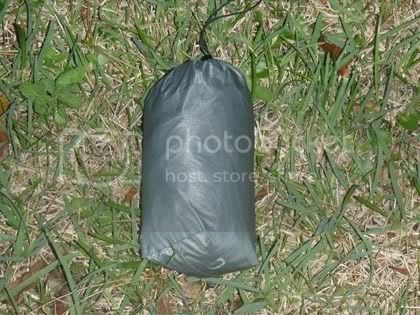 I hurriedly opened the stuffsack and laid the tarp out on the ground. Suddenly I had a horrid realization. 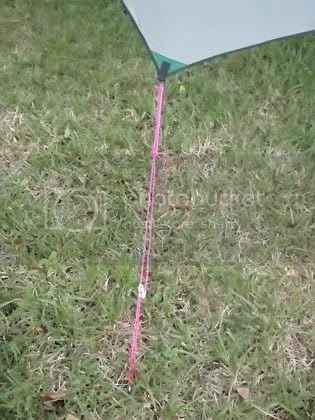 Earlier today I picked up 75′ of hot pink 5/23″ poly rope. I’d planned on making new tie-outs at 10′ each. This would give me plenty of line if I had to go further than planned to stake the tarp out. I counted 8 tie-outs from memory which meant I ended up cutting to 9′ instead for a total of 72′. Well, when I saw it on the ground I realized the sides only had a single cat cut, not the double I remembered. That’s for the 12′ Ultra model. Dang. Also, if I use a separate ridgeline instead of individual tie-outs for the ends I’ll use the prusik knots and biners. That’s two less lines I’ll need. So here’s a tip: don’t cut tie-out lines until you’ve verified what you need. Well, I sucked it up and started putting it up. Since my trees in the backyard are so close to the fence, I cheated and put two hooks in the fence to connect the lines to on one side. Here’s the overall look. 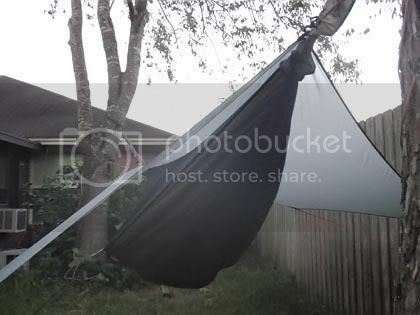 It looks like the MacCat is a little off center with the ridgeline but once I’m in the hammock the sag drops it down and the tarp is perfectly pitched. Here’s a closeup of the hot pink line and my Figure 9 tensioner. And the end tie-out held taut by a Figure 9 biner and ridgeline prusik. 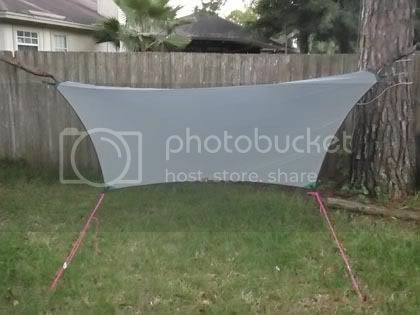 And finally, the hammock and tarp together. I was a little concerned when I first started putting up the MacCat. I wondered if I should’ve gotten the Ultra for its longer ridgeline. Well, I don’t think that’s a concern now. Laying in the hammock I think it’ll provide plenty of coverage. 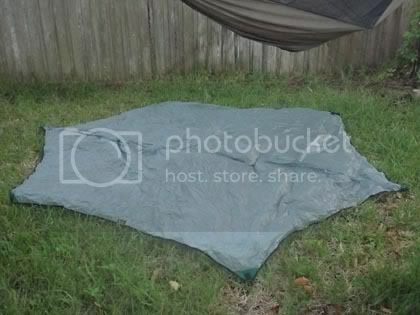 On the ground I think there’s definitely enough coverage to sit under the tarp during a storm to cook or just relax. So far I’m very pleased. Construction is top notch!